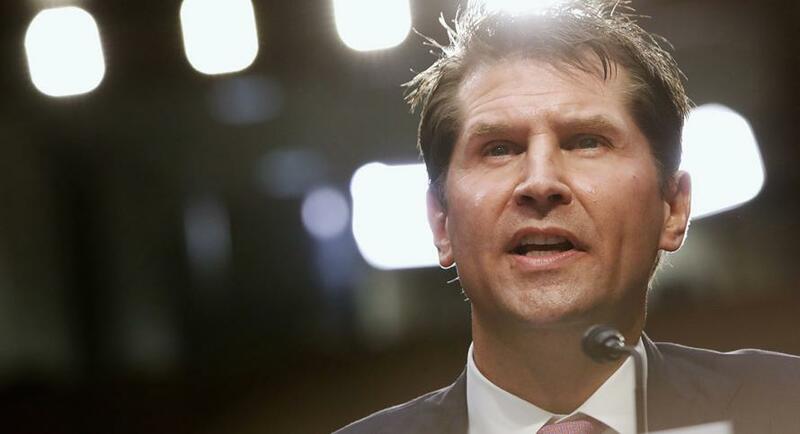 FBI Counterintelligence chief, Bill Priestap, will sit down for a closed-door session with lawmakers on Tuesday, according to John Solomon of The Hill. Priestap will be answering questions about the Hillary Clinton email case as well as the counterintelligence operation on the Trump campaign - both of which he oversaw. 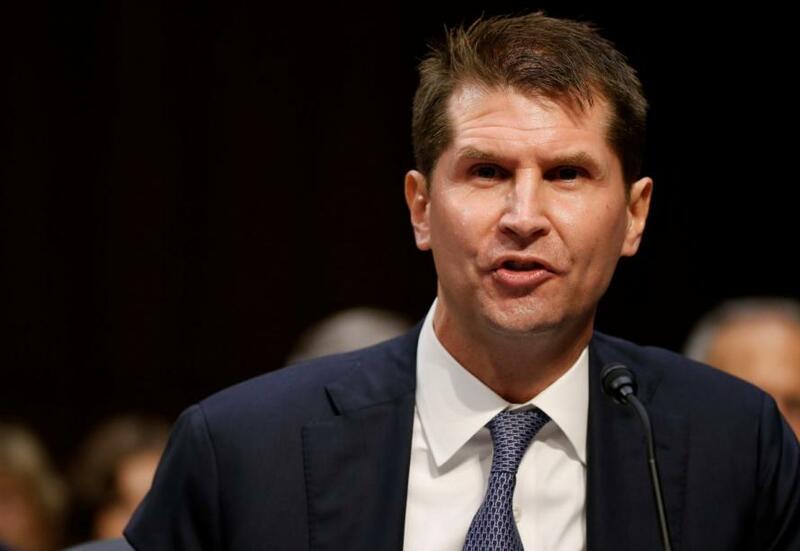 Priestap was the direct supervisor of Peter Strzok - the FBI agent whose anti-Trump / pro-Clinton bias was revealed after 50,000 text messages to his FBI-attorney mistress, Lisa Page, were discovered by the DOJ's Inspector General, Michael Horowitz. All accounts say that Priestap is a cooperating witness. In other words, if there's one person who can confirm that the FBI counterintelligence operation on the Trump campaign was politically motivated - or that malfeasance occurred during the process, it's Bill Priestap. Solomon: "I think tomorrow is going to be a pivotal day. I think Congress is going to learn a lot of new information tomorrow during these interviews." Dobbs: He is going to be speaking candidly about his employer, the FBI, and those who were running the agency during that period. Solomon: He was very high up. Had a bird's-eye view of everything that went on in both of these investigations. While the session will be closed-door, we imagine leaks will be forthcoming as seems to be standard operating procedure these days. The game is over. The jig is up. Victory is certain... the trench was ignited... the enemy funneled themselves into the valley... all bait was taken… everything from here on out is simply mopping up the details. All suspicions confirmed. Why has Devin Nunes been so confident? Why did all GOP HPSCI members happily allow the Democrats to create a 10-page narrative? All questions are answered. 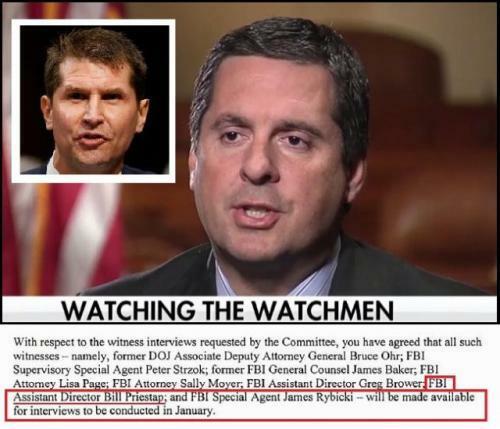 House Permanent Select Committee on Intelligence member Chris Stewart appeared on Fox News with Judge Jeanine Pirro, and didn’t want to “make news” or spill the beans, but the unstated, between-the-lines, discussion was as subtle as a brick through a window. Judge Jeannie has been on the cusp of this for a few weeks. When you understand how central E.W. “Bill” Priestap was to the entire 2016/2017 ‘Russian Conspiracy Operation‘, the absence of his name, amid all others, created a curiosity. I wrote a twitter thread about him last year and wrote about him extensively, because it seemed unfathomable his name has not been a part of any of the recent story-lines. E.W. “Bill” Priestap is the head of the FBI Counterintelligence operation. He was FBI Agent Peter Strozk’s direct boss. If anyone in congress really wanted to know if the FBI paid for the Christopher Steele Dossier, Bill Priestap is the guy who would know everything about everything. FBI Asst. 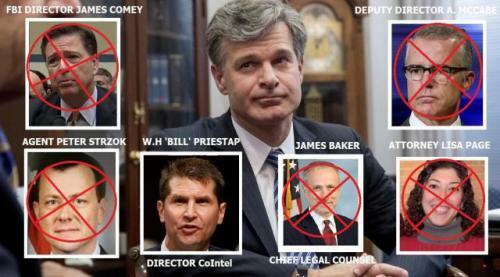 Director in charge of Counterintelligence Bill Priestap was the immediate supervisor of FBI Counterintelligence Deputy Peter Strzok. Bill Priestap is #1. Before getting demoted Peter Strzok was #2. The investigation into candidate Donald Trump was a counterintelligence operation. That operation began in July 2016. Bill Priestap would have been in charge of that, along with all other, FBI counterintelligence operations. FBI Deputy Peter Strzok was specifically in charge of the Trump counterintel op. However, Strzok would be reporting to Bill Priestap on every detail and couldn’t (according to structure anyway) make a move without Priestap approval. On March 20th 2017 congressional testimony, James Comey was asked why the FBI Director did not inform congressional oversight about the counterintelligence operation that began in July 2016. FBI Director James Comey was caught entirely off guard by that first three minutes of that questioning. He simply didn’t anticipate it. Obviously, based on what we have learned since March 2017, and what has surfaced recently, we can all see why the FBI would want to keep it hidden that they were running a counterintelligence operation against a presidential candidate. 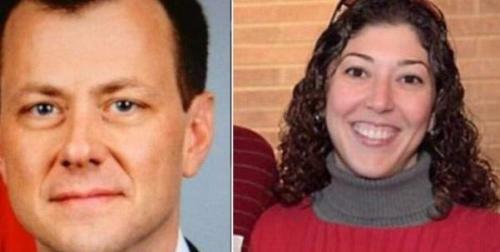 After all, as FBI Agent Peter Strzok said it in his text messages, it was an “insurance policy”. So there we have FBI Director James Comey telling congress on March 20th, 2017, that the reason he didn’t inform the statutory oversight “Gang of Eight” was because Bill Priestap (Director of Counterintelligence) recommended he didn’t do it. Apparently, according to Comey, Bill Priestap carries a great deal of influence if he could get his boss to NOT perform a statutory obligation simply by recommending he doesn’t do it. Then again, Comey’s blame-casting there is really called creating a “fall guy”. FBI Director James Comey was ducking responsibility in March 2017 by blaming FBI Director of Counterintelligence Bill Priestap for not informing congress of the operation that began in July 2016. (9 months prior). At that moment, that very specific moment during that March 20th hearing, anyone who watches these hearings closely could see FBI Director James Comey was attempting to create his own exit from being ensnared in the consequences from the wiretapping and surveillance operation of candidate Trump, President-elect Trump, and eventually President Donald Trump. In essence, Bill Priestap was James Comey’s fall guy. We knew it at the time that Bill Priestap would likely see this the same way. The guy would have too much to lose by allowing James Comey to set him up. Immediately there was motive for Bill Priestap to flip and become the primary source to reveal the hidden machinations. Why should he take the fall for the operation when there were multiple people around the upper-levels of leadership who carried out the operation. Our suspicions were continually confirmed because there was NO MENTION of Bill Priestap in any future revelations of the scheme team, despite his centrality to all of it. 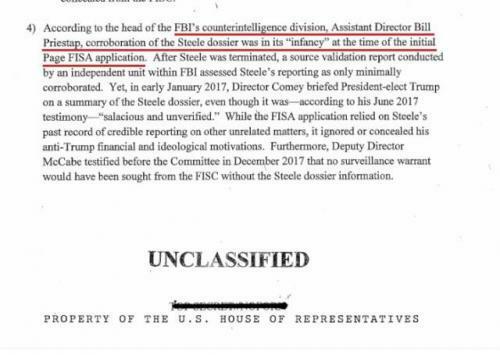 Bill Priestap would have needed to authorize Peter Strzok to engage with Christopher Steele over the “Russian Dosssier”; Bill Priestap would have needed to approve of the underlying investigative process used for both FISA applications (June 2016, and Oct 21st 2016). Bill Priestap would be the person to approve of arranging, paying, or reimbursing, Christopher Steele for the Russian Dossier used in their counterintelligence operation and subsequent FISA application. Without Bill Priestap involved, approvals, etc. the entire Russian/Trump Counterintelligence operation just doesn’t happen. Heck, James Comey’s own March 20th testimony in that regard is concrete evidence of Priestap’s importance. Everyone around Bill Priestap, above and below, were caught inside the investigative net. Above him: James Comey, Andrew McCabe and James Baker. Below him: Peter Strzok, Lisa Page, Jim Rybicki, Trisha Beth Anderson and Mike Kortan. Parallel to Priestap in main justice his peer John P Carlin resigned, Sally Yates fired, Mary McCord quit, Bruce Ohr was busted twice, and most recently Dave Laufman resigned. 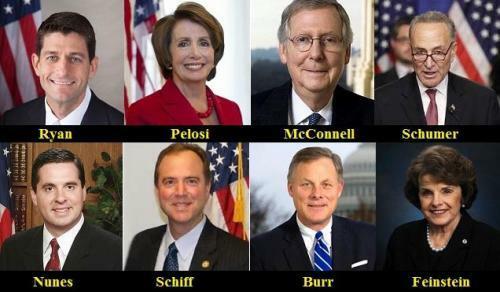 All of them caught in the investigative net…. Only Bill Priestap remained, quietly invisible – still in position. Likely Bill Priestap made the decision after James Comey’s testimony on March 20th, 2017, when he realized what was coming. Priestap is well-off financially; he has too much to lose. He and his wife, Sabina Menschel, live a comfortable life in a $3.8 million DC home; she comes from a family of money. While ideologically Bill and Sabina are aligned with Clinton support, and their circle of family and friends likely lean toward more liberal friends; no-one in his position would willingly allow themselves to be the scape-goat for the unlawful action that was happening around them. Bill Priestap had too much to lose… and for what? With all of that in mind, there is essentially no-way the participating members inside the small group can escape their accountability with Mr. Bill Priestap cooperating with the investigative authorities. Now it all makes sense. Devin Nunes interviewed Bill Priestap and Jim Rybicki prior to putting the memo process into place. Rybicki quit, Priestap went back to work. Bill Priestap remains the Asst. FBI Director in charge of counterintelligence operations. I don’t want to see this guy, or his family, compromised. This is probably the last I am ever going to write about him unless it’s in the media bloodstream. I can’t fathom the gauntlet of hatred and threats he is likely to face from the media and his former political social network if they recognize what’s going on. BP is Deep-Throat x infinity… nuf said. The rest of this entire enterprise is just joyfully dragging out the timing of the investigative releases in order to inflict maximum political pain upon the party of those who will attempt to excuse the inexcusable. Then comes the OIG Horowitz report.